I went to the last performance (of only three!) of the run of Poulenc's Dialogues des Carmelites which closed out the Met's season. The production and orchestra were solid, but it was the vocal performances that gave the evening its intellectual and emotional intensity. John Dexter's classic production is strong and stark, though it's hard for me to put myself in the place of audiences who saw it as revolutionary. Before the opening bars of the score are heard, we see the nuns all prostrate in the cruciform position. The grille, the rood screen, the prison bars all descend, making effective minimalist surroundings for naturalistic presentation. I quite liked the airy form of the grille, the incorporation of the cross into its pattern, emphasizing the voluntary rather than the absolute nature of the nuns' enclosure. The stage is marked--defined--by an ever-present cross. Its shape is obscured only at a handful of moments: it is in shadow while Blanche is in her father's house, cut off by the library with its Fragonard-like painting. Again it is partially hidden during the prioress' death scene, though she is in its light. During the martyrdom, the crowds mill in the transept, blind to it. I really liked this use of space suggesting the form of grace, the force of it even (especially?) in the mundane. Louis Langrée, known to me as a Mozartean, conducted with intelligence and sensitivity. The orchestral texture was hauntingly transparent, but I thought that stronger emphasis on Poulenc's repeated (and transformed) motifs, and perhaps slower tempi and more dynamic variety, might have given additional orchestral gravitas, which I rather missed. Langrée was supportive of the singers, however; all the women gave strong performances and, perhaps as importantly, had excellent chemistry with each other. Met debutant Philip Skinner, as the Marquis (and replacement for David Pittsinger) was vocally quite good, though his French wasn't always intelligible or emotionally nuanced. Paul Appleby was quite touching as the Chevalier, and sang with good style, though from my family circle box he wasn't always perfectly audible. Priest was moving, with strong sinewy tenor. Elizabeth Bishop brought welcome subtlety to the role of Mère Marie, showing real tenderness for the old prioress and for Blanche in their moments of greatest weakness. Her Marie, sung (and characterized) with a fine, rich mezzo, was resolute to a fault but understandably so. 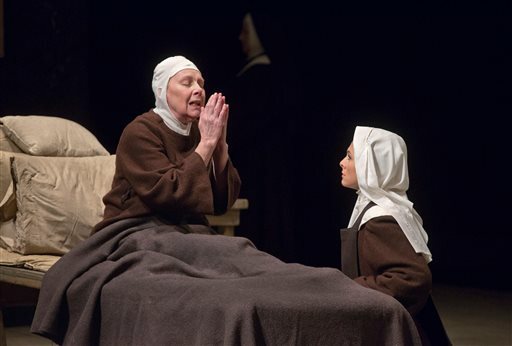 Erin Morley's bright soprano is a good fit for Soeur Constance and Morley sold the role convincingly, pouring out her heart and sending her notes soaring. Felicity Palmer, as the Old Prioress, was breathtakingly, almost unbelievably good. Although her vocal resources are somewhat diminished (or at least altered) by age, she showed thorough command of them. She was a captivating presence even in stillness, and in her death scene, aided by superb use of text, Palmer was absolutely mesmerizing. She was also in good company. Patricia Racette sang with consistent, radiant beauty of tone, and captured perfectly Madame Lidoine's warmth, her steadfastness, her clarity of vision, and above all her love. She has excellent French, and used it well to express Madame Lidoine's steely edge, as well as her generosity. I cried helplessly during the final monologue where she told all her daughters she loved them. Isabel Leonard, as Blanche, was proud and reserved and absolutely gorgeous vocally, with gleaming richness of tone. Her steadiness was, indeed, somewhat odd in the role of a woman seen by many as neurotic. Interestingly to me, Leonard's Blanche lacked self-knowledge till the end. There was always, always that reserve, not the agony of a visionary, but the agony of one who does not see. She comes close to insight in contemplating the broken statue as the lamb of god, but she doesn't know what that means. It is, then, her sisters who reveal grace to her in the hour of their death, enabling her to show and accept grace in her turn. I was stifling sobs through most of the closing scene; at the curtain, the elderly gentleman sitting in front of me turned and said, "It's unlike anything else in opera." And I'm inclined to agree with him.